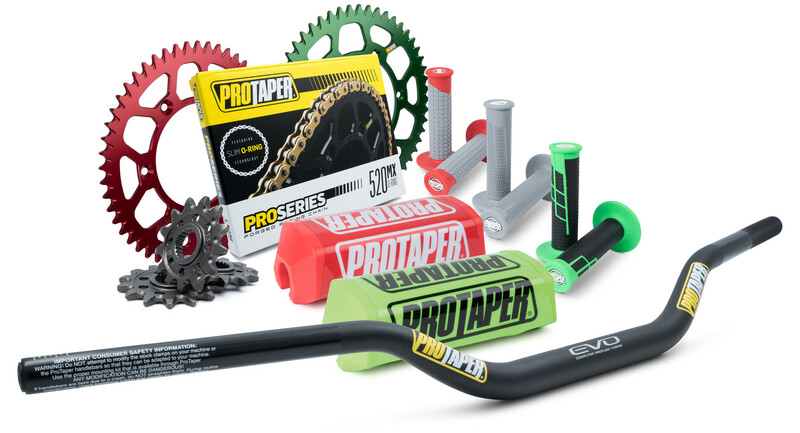 Whoa, ProTaper unleashed a whole lot of goodness to start off the shopping season. Ready? Let’s dive in. ProTaper MX Race Spec (RS) Rear Sprocket ($69.99) are constructed from heat-treated 7075-T6 aluminum alloy, and CNC-machined to precise tolerances here in the USA. They’re self-aligning, and feature an exclusive angled mud groove design for self-cleaning during your motos, to prevent horsepower loss and minimize wear. Details include a deep penetrating anodized finish (hard ano on black sprockets); and machined edge chamfers to eliminate sharp edges, reduce weight, and make for a cleaner appearance. If you’re looking for a precise fitment, optimal weight savings, and perfect balance up front, the ProTaper MX Race Spec (RS) front sprockets ($25.99) are CNC-machined and internally broached to precise tolerances from case-hardened, core-refined chromoly steel. You’ve got etched teeth number markings for easy ID, and a proprietary coating further reduces wear and corrosion, yielding a front sprocket unparalleled in the market. Moving up front, there’s the always-popular ProTaper EVO Handlebar ($89.99), which is their top-of-the-line model without a crossbar. Oversized diameter bars, without crossbars, were invented and patented by ProTaper in 1991, to allow the bar to flex more and better absorb impacts. That gives you more comfort and reduces fatigue without sacrificing bar strength. Whether you’re looking to take the edge off of rough tracks, or just a little more comfort, the EVO Handlebar’s computer-profiled 4mm wall design will give you looking for. Remember, these are oversized bars, so you’ll need different clamps if your bike isn’t already equipped with them. You want details? How about a stress-relieved, shot-peened and anodized finish for unmatched durability? Or an epoxy inner coating that resists corrosion, and plastic bar end plugs keep the elements out and provide a stronger base for grip ends? Of course, if you have the ProTaper EVO bars, you’ll want a ProTaper 2.0 Race Series Bar Pad ($19.99). Available in nine colors, there’s something for every style. You get durable high-density closed-cell foam for impact protection, a fuel vent line cutout for steering stem access, and the revised cover designs for improved fit and finish. To cap everything off, there’s the ProTaper Clamp-On Grip System ($27.99). These babies use the latest in grip technology and molding techniques to offer the comfort and control of traditional grips with the added advantage of quick and effortless installation. The design eliminates the need for glue and safety wire, yet ensures durable, slip-free performance. On the left side you get a Windowed Core that not only minimizes the outer grip diameter, but also delivers critical relief areas for the palm and fingertips. The result is increased impact and vibration damping over competing solid-core designs, leading to significantly improved rider comfort and control. The extra-supple, tacky compound is seamlessly molded to the inner core for maximum comfort and traction while alleviating blistering. A firmer compound is used in the flange and endcap areas to resist crash damage and reduce wear. Take your pick of three grip patterns, and a variety of colors. Where to get all this goodness? ProTaper products can be purchased from your local Tucker Rocky dealer/retailer or any of the major online retailers. Could use this on my build! my yz250 loves pro taper parts! I could use all of this PT stuff!